We’re experiencing the “third peak” of gin. You can find a vast variety of styles and flavours in bars, restaurants and shops. Distillers and entrepreneurs have embraced the chance to meet demand and interest. Over the past five years the number of UK distilleries has increased by 127%. Thanks to gin’s resurgence there are many more tonics to quaff too. Daniel Shipman of Roister Events joined me in the Sheffield Live radio studio on Friday. 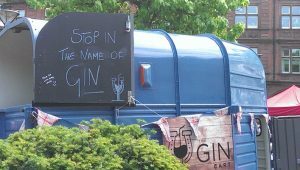 Roister’s small team are running the Gin Fever Festival at Kelham Island Museum (on 21 and 22 September). Daniel spilled the beans on gin’s history as a medicine, how it gained popularity in England, what led to the Gin Act in 1751, a second and now third peak in popularity, and of course everything taking place at the (free to attend) Gin Fever Festival, featuring 100 gins, music, food and more. For some, Daniel has a dream job, organising a gin festival and working in the hospitality industry. So I asked about his path to this role and his advice for anyone wanting to build a career or a business in food and drink. 32:33 – 42:22 nominations open for the 2018 VAS Make a Difference Awards; forthcoming events including VAT Breakthrough, the Business and IP Centre Sheffield workshops and Diversity Fest; getting in touch; wrapping up.